The highlight of any Lufthansa First Class journey departing Frankfurt is a visit to the airline's First Class Terminal. Pure luxury, exclusiveness and glam! Here’s a review of my recent visit to the terminal. This facility is exclusive on purpose ­– and it’s not easy to get in! You can’t get past the main doors with status alone – unless you have HON Circle - Lufthansa’s top frequent flyer tier. Instead you need to be flying out First Class on Lufthansa (or arriving on it, with a same day first or business connection on Lufthansa, Swiss or Austrian). If you’re taking a cab, there’s a separate exit for the terminal from the Frankfurt roadway. If you’re arriving on another flight, you need to clear customs, exit the main terminal, walk left until you pass the taxi rank (which can be a bit of a hike depending on where you start). Once you pass the rank, you'll see the First Class Terminal. There’s an entrance at the bottom with a door bell – press that – and take the elevator up to the main level. You definitely feel like you're in a private club – full of wealthy people or business titans! There’s a lot of windows – but truthfully not a lot to see. The terminal is situated back from the tarmacs so there’s isn’t an opportunity to plane spot. 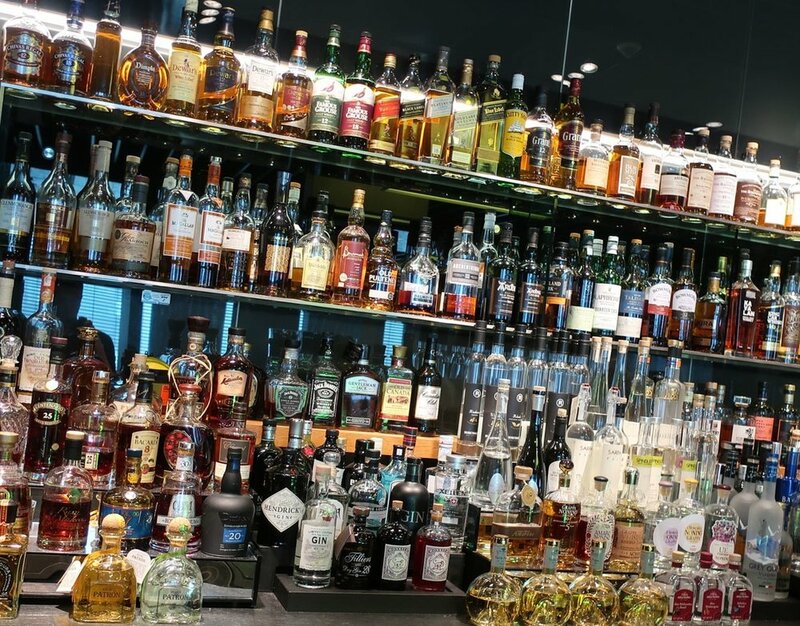 The bar is spectacular – something I haven’t seen, even in luxury hotels! The most demanding celebrity would be happy here! The selection is overwhelming – and it’s definitely focused on premium top-shelf brands. All of the drinks are complimentary including $170 USD a bottle Johnnie Walker Blue Scotch and $250 Hennessy XO Extra Old Cognac! Fear not though if you are looking for vine based beverages. 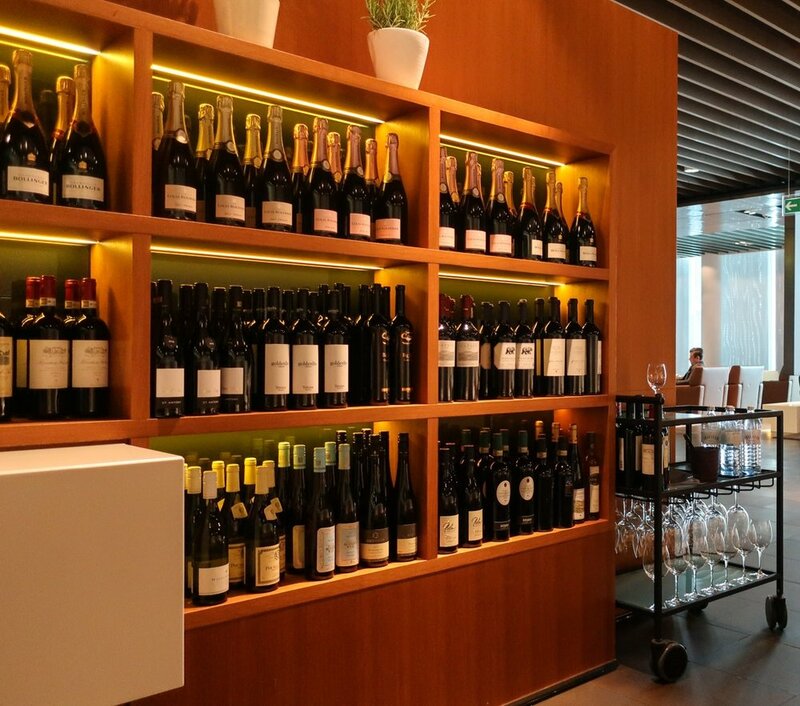 There’s a whole wall of wines and champagnes to select from! White and Rose bubblies include Ab Fab favorite: Bollinger Special Cuvee Brut NV. And if you want something sans alcohol there’s a mind-boggling selection on that front. Besides the normal java-based beverages, there’s all kinds of juices (including banana!) and over a dozen different kinds of bottled waters. Don’t go to this lounge hungry! There’s enough luxury food in there to cater a Kardashian wedding! If you want a quick bite, there’s a fabulous buffet that showcases a spread of sweet and savory treats. 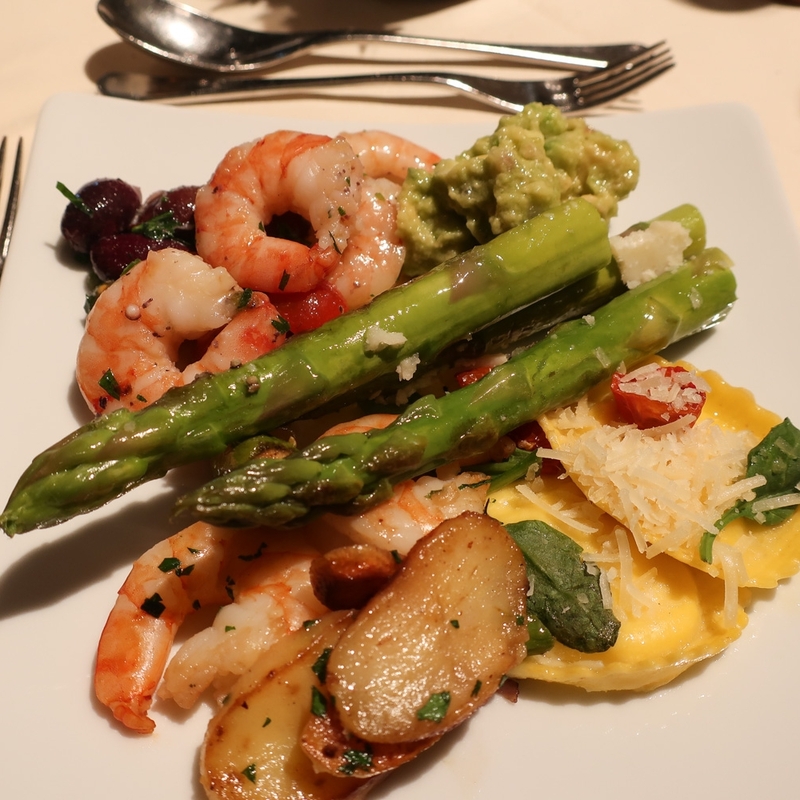 Asparagus salad, smoked salmon, French cheeses, Mediterranean Mezés, shrimp salad, fresh guacamole, and lemon ravioli are just some of the (many) dishes on display. There’s also full-service options. You can order dishes off the menu – including a scrumptious Wiener schnitzel with warm potato salad (a Lufthansa First Class Lounge favorite!). I was in the city for the day touring around – and they were a welcome site in the lounge. 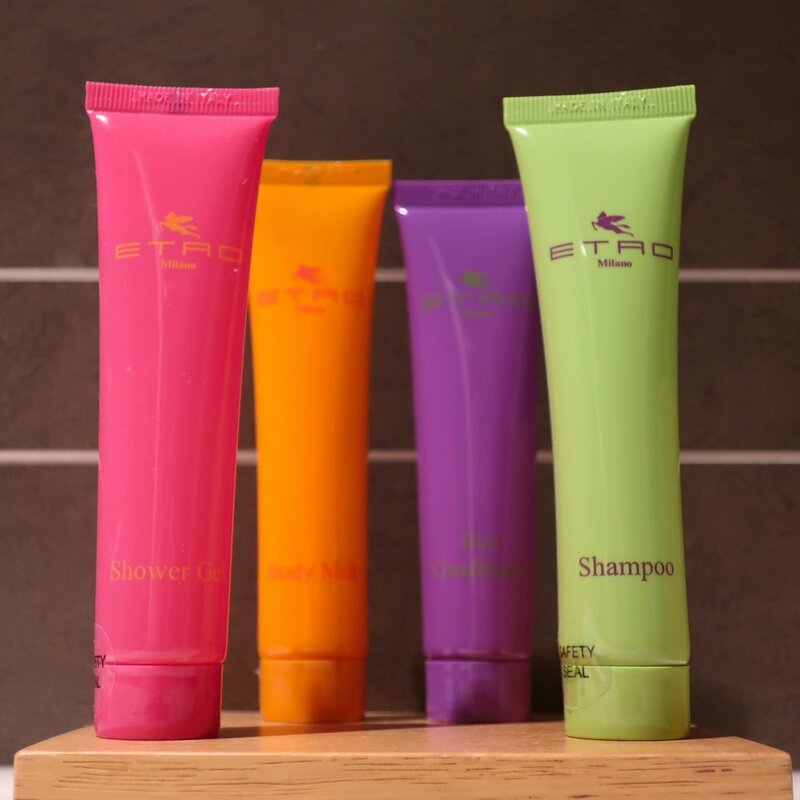 My stylish, roomy shower unit came equipped with a bathrobe, plush towels, and luxe ETRO bath products. There's a rain shower that's totally relaxing in each room. If you want to be extra decadent though – you can request a chamber with a full-on tub and have a bubble bath! One of the first things you notice when you come in this lounge is that it’s not connected to any gates. No worries – the rich and famous will not miss their flights. Instead of walking to your departure flight – you are shuttled there in a private transport (that you may share with a couple other fellow travelers going to your destination). This is truly an eye-opening experience on how the top 0.5% live. An attendant collects you when your flight is ready depart, escorts you down to private (dedicated) customs clearance, and brings you to a parked vehicle – either a Mercedes or a Porsche. Your driver then whisks you via the tarmac to your awaiting flight. You are put in a private elevator and escorted down the jetway to the airplane door. Lufthansa was one of the original carriers to embrace the First Class super lounge concept. Their facility in Frankfurt is still a leading lounge in that category. Sophisticated – Luxurious – & Premium. My first visit to this space dedicated to glam was almost ten years ago – and it’s still a fabulous club. A truly exceptional treat when it comes to spending time at the airport – even for people who practically live in lounges!